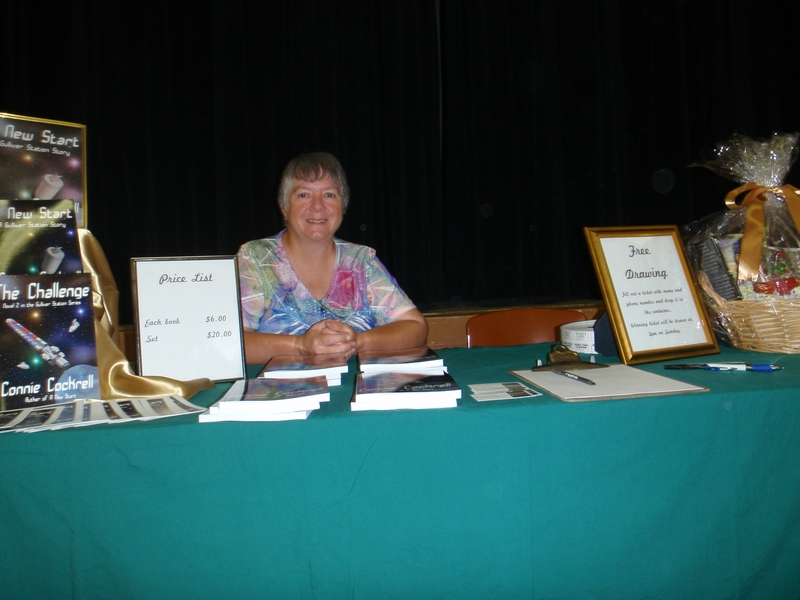 I organized a book signing for this weekend’s craft fair. http://pinestrawberrybusinesscommunityaz.com/fallapple.html I started a couple weeks ago, contacting the fair people and it happened a fellow author volunteers for the event. We teamed up and were hoping to get an outdoors 10X10 ft. space for a discount. It turns out they had space inside and the other authors (3 of them) that we were going to shoehorn into the space, sharing the cost, would get tables inside too, all for the fact the one author volunteers. Yay! So five 8 ft tables indoors. Here’s the low down on all of them. I sold the entire Gulliver Station series at the craft fair. I sold 4 complete sets and 2 of the first novel of the series. I also had 11 people sign up for my newsletter. I’m calling that a win. You can find links to locations were you can find all of my books on the Books tab on this blog site. I also have an Author Page on Amazon where you can find a list of my books. 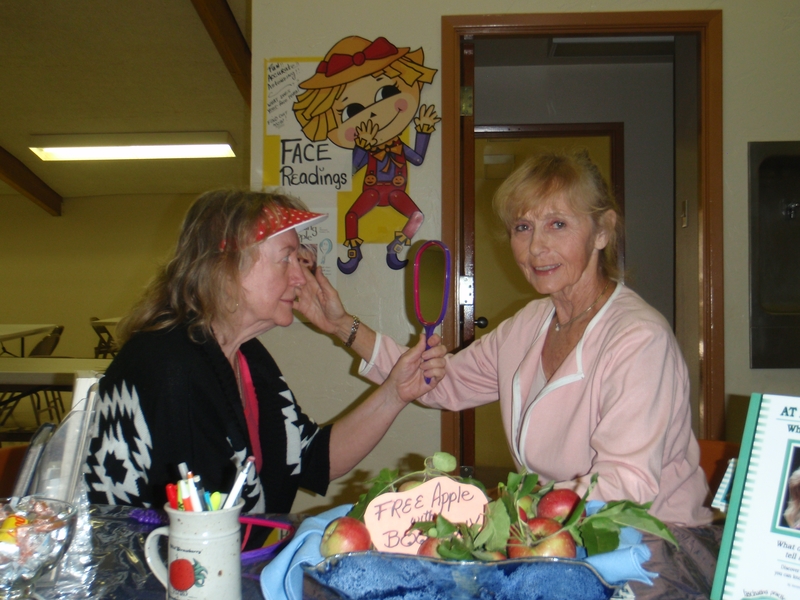 This is the wonderful volunteer. Many thanks Nancy. She had two books at the signing, her first book: Retirement: Sacred or Scared and her newest book, Enjoy the Apple: You Picked It. Click on the titles to go to the Amazon links. She calls these Spiritual Adventure books. 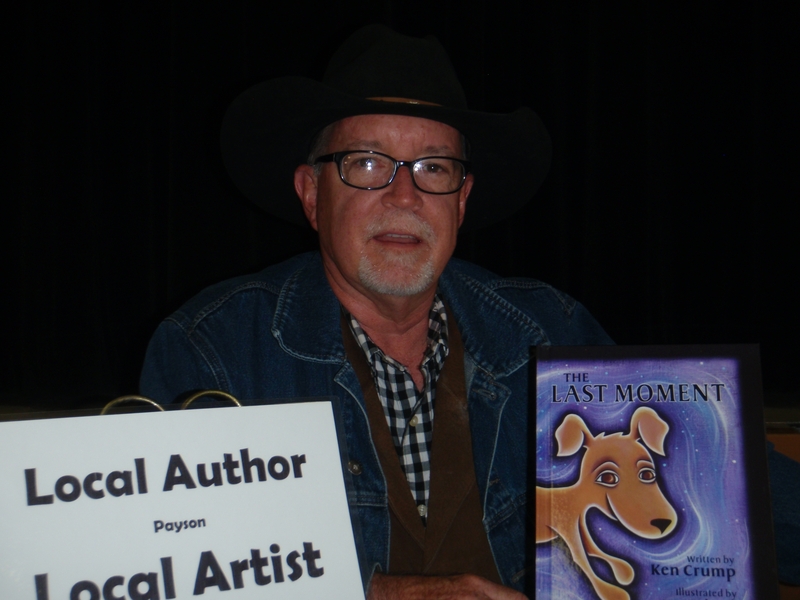 Ken brought his children’s book, The Last Moment, to sell and sign. Click on the book title to get to the Amazon page. He had a wonderful illustrator for the book, Amy Abney, also local to my area. Her art work is amazing. His blog is www.brickhousepiggy.com and can be reached at KenCrumpAuthor@gmail.com. 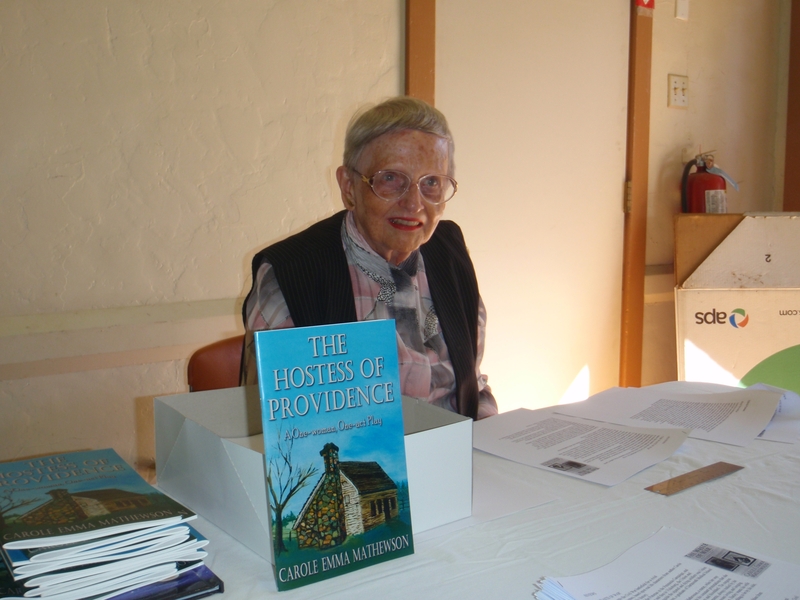 Carole has two books out, The Hostess of Providence, a one woman play, and her newest book, The Waste of War, a Civil War era Historical Fiction that is about her great-grandparents, a Union surgeon and his wife, who served as his nurse through some of the most horrendous parts of the Civil War. She brought her Self Help/Psychology book, At First Glance: What Faces Reveal. She spent much of Saturday doing readings for people. It was quite well accepted. Her site is www.HurrahForHumans.com and can be reached at Annemarie@HurrahForHumans.com. We all had a great time chatting with craft fair goers, trading writing tips and enjoying a wonderful camaraderie. The basket drawing was won by Tara Fuller of Chandler who has donated the basket back to us. We’ll have to decide what to do with it now. I threw all the rest of the tickets away in Pine so have no way to draw a new winner. I for one, learned a few things. – Many people saw my SciFi books and assumed they were for kids. I had to gently tell them they had adult themes. – People visiting a craft fair tend to walk as far from the tables as they can get and do their best not to make eye contact. – Having a drawing, which we did, brings people in close enough to chat. 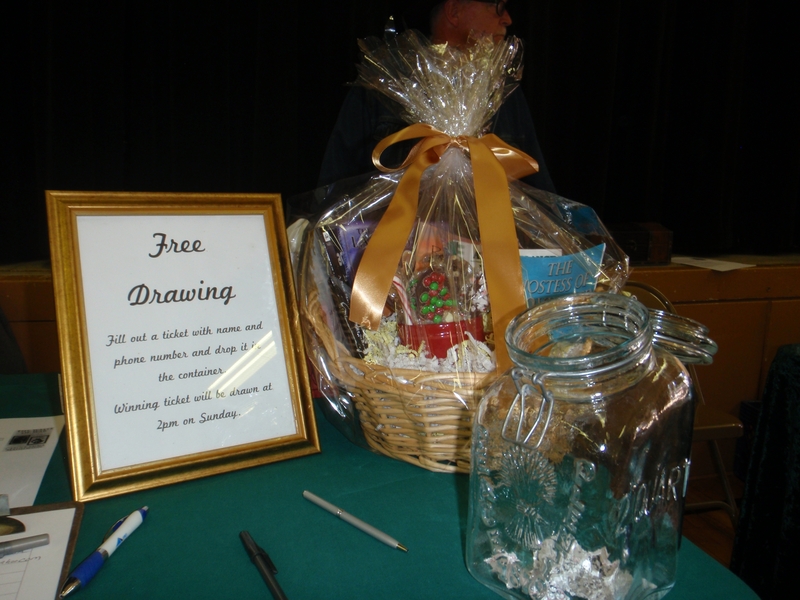 Our drawing was a basket with one book donated by each author and a big mug with 5 different ways to make hot chocolate. If the word free didn’t bring them in to make out a ticket to drop in the jar, the word chocolate seemed to do the trick. – Once you have them in to chat, we had great conversations and some people even took our business cards. A few even bought a book. – Catchy book titles will bring passing visitors in for a look. 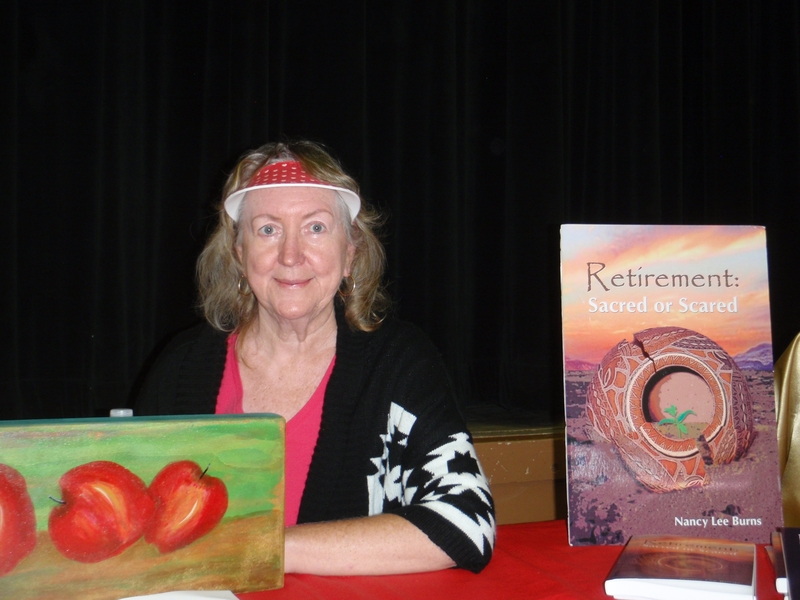 Nancy’s book, Retirement: Sacred or Scared generated quite a few conversations. – Don’t throw the drawing tickets away until we actually get the prize to someone. Overall, we had a great time and hope we can get together again sometime. This entry was posted in Author, Book Signing, Connie Cockrell, Craft Fair, Other Authors, Other Blogs and Blog Sharing, Promotions, Published Books and tagged Book for Sale, Craft Fair, Making Friends, Other Authors, Promotions, Sharing Blogs, Weekend Fun by conniejean. Bookmark the permalink. Glad it was so successful!